"And a Temple was built to Saturn to the east of the Fish Bridge and every year there is a three days' feast to him, and near this is a bath into which they entered gratis during the feast." Presumably the Fish Bridge is one of the five that connect the Island to the rest of the city. Remnants of one of these five smaller bridges (at the Dog Gate) still exists according to reports from the 1930's excavations. The main bridge at the bridge gate survived until the 1960s when it was barbarously demolished to make way for traffic improvements. It is shown above in the early twentieth century photo. It was so solid that it had survived from Roman times in excellent condition. However, it also was so massive that it may have contributed to the flooding from which the town regularly suffered. 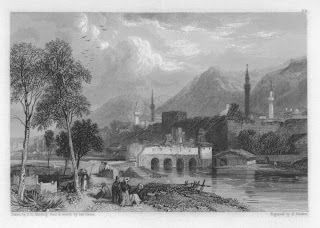 Below we have an earlier etching from 1835. This shows the bridge with structures built along it. They appear somewhat ruined and were later demolished. Their damaged state may be a result of the earthquake of 1822.